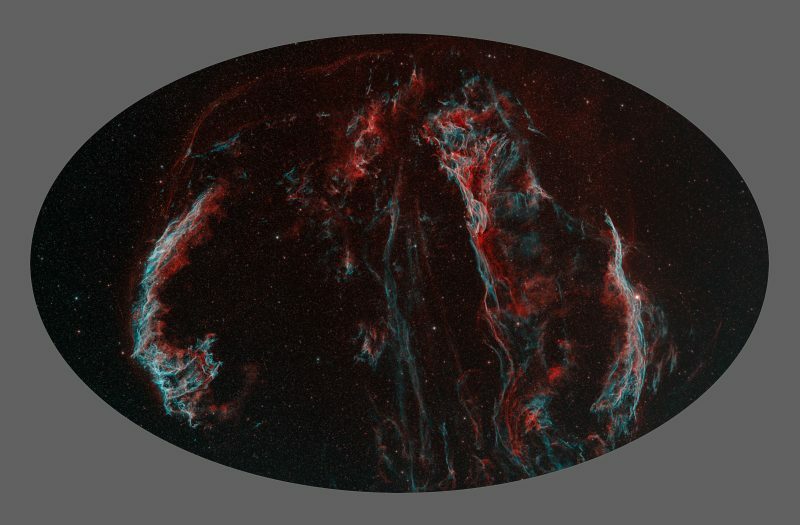 This region of space in Cygnus is collectively known as the Veil Supernova Remnant (SNR). It is composed of 3 main components — the eastern (left) portion, aka NGC 6992, commonly called the “Network Nebula”; the bright north central portion, aka NGC 6979, usually referred to as “Pickering’s Triangle”; and the western (right) portion, aka NGC 6960, which goes by the moniker “Witch’s Broom Nebula”. The supernova that gave rise to the Veil exploded about 3,000 to 6,000 BC. The nebula is probably about 1500 light years away. Takahashi FSQ-106N; SBIG STL11K; Paramount ME; 1800 sec subs (Ha X 40, OIII X 40) using Maxim & ACP. Processed as a bicolor in Photoshop using the RGB = (Ha)(OIII)(OIII) method. Data acquired from Pennsylvania home observatory in the fall 2016.